Between the years 1964 and 1973, America had deployed an estimated 4,000 war dogs and 10,000 handlers to help defend South Vietnam from invasion from North Vietnam. During the ground war, Veterinarians and Vet Techs were also deployed throughout South Vietnam to help manage the diets and medial health of the war dogs. The success of the war dogs and handlers walking point, tracking, guarding, patrolling, and protecting American lives and military assets, ultimately reduced the enemy’s capacity for surprise attacks. As a result, the enemy placed a price tag on the heads of the war dog teams and hunted them with extreme prejudice. 1973 is significant because that was when the United States ceased ground combat operations and withdrew the last of its ground combat forces from South Vietnam. The several thousand surviving war dogs were crated and no longer performing their jobs in the field because their masters were ordered out of South Vietnam. South Vietnam fell to North Vietnam in 1975, which officially ended the war. The decision to classify the war dogs as equipment and leave them all behind (several thousand) after the war remains the saddest chapter in America’s military working dog history. Their final fate was either to be transferred to the South Vietnam Army or to be euthanized after each war dog unit was methodically and strategically deactivated throughout South Vietnam. Very few dogs were redeployed to U.S. bases outside of South Vietnam to live out their lives in peace. And there was no war dog adoption law until the year 2000 when WWII Marine War Dog Platoon Leader/Veterinarian, Dr. William Putney made it happen with the help of U.S. Congressman, Roscoe Bartlett of Maryland. The German shepherd dog was the only breed trained for this job. The handler and dog led combat patrols and provided an early silent warning of danger. 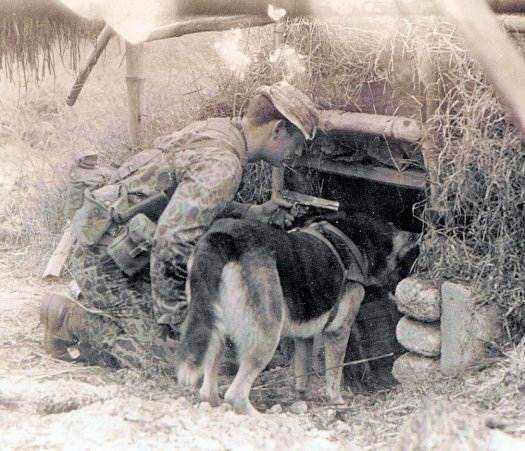 A scout dog team was deployed as “pointman” which is the most vulnerable and dangerous position of a tactical formation moving through enemy territory. Scout dogs were trained to alert on enemy movement, booby traps, land mines, base camps, underground tunnel complexes, and underground caches of weapons, food and medical supplies. The U.S. Army had the highest number of infantry scout dog teams deployed throughout South Vietnam and consequently suffered the highest number of casualties, dogs and handlers, of the war. The Labrador retriever dog was the only breed trained for tracking. Their primary role was to track the enemy’s scent or blood trails throughout South Vietnam, so that larger American forces could reengage. Black and yellow Labs were favored. Labs were friendly, handled the heat okay and had a natural instinct for tracking ground scent. And it took less time for a Lab than a German shepherd to get used to a new handler. The tracker dog teams were very effective and relied on heavily. The German shepherd dog was the only breed used for this job. 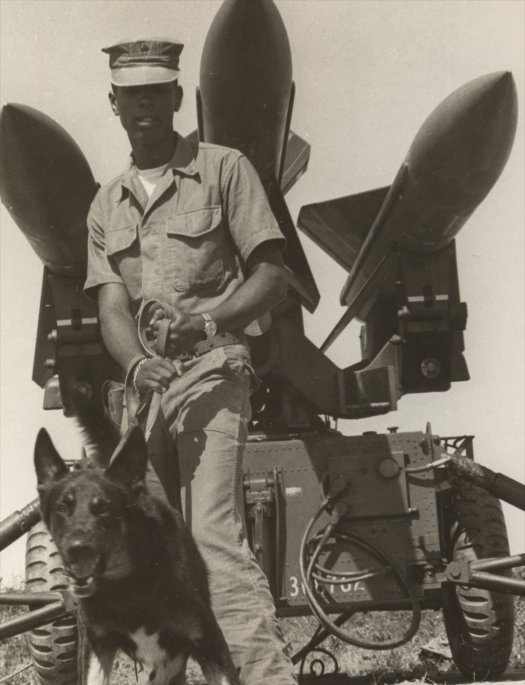 The dog and handler were very effective in defending aircraft, airfields, supply depots, ammunition dumps, defensive perimeters, and many other strategic military facilities throughout South Vietnam. Sentry dog teams were deployed as the first line of defense guarding American base camps day and night. The German shepherd dog and handler were generally deployed with the infantry and combat engineer units. They were trained to sniff out mines and booby traps buried in roads, hidden on bridges or in buildings, and sniff out the location of tunnels. After the dog located the tunnel, a soldier (Tunnel Rat) would enter the tunnel to investigate. The Navy successfully used dogs on slow trolling patrol boats operating throughout the American patrolled waterways of South Vietnam. The dog was deployed to alert on the breath scent of enemy underwater divers breathing through reeds, snorkels and other underwater apparatus. The water dogs proved to be quite successful in saving lives and equipment, reducing the enemy’s capacity to conduct underwater sabotage operations. 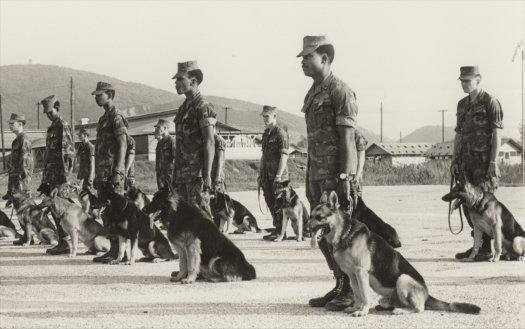 The dogs were given to the ARVN, and were used in combat. A Marine dog handler I knew finished his 13-month tour of duty in 1969 and was told his dog, Taddy, was being transferred to the ARVN. He extended for a month-in-country to help Taddy get accustomed to her new situation. When he went home, he stayed in contact with Taddy’s ARVN handler. There was an epidemic of parvovirus that year that killed a lot of dogs in Viet Nam, and Taddy got sick. My Marine friend got medication, food, vitamin supplemens from a veterinarian and shipped them to the ARVN. I don’t know anything more. my dad name was gunny elzie pence he work dogs in nam he was there 3 times looking to see if anyone knew him.thank his son scot ps iam also a honorable marine of 4 years.